Earlier today, the Boston Societies or Spontaneity hosted our local version of Improv Everywhere's infamous No Pants event. Back in 2002, Improv Everywhere began riding New York City's subway as a little prank; since then, it has exploded into an annual global phenomena with thousands of participants. 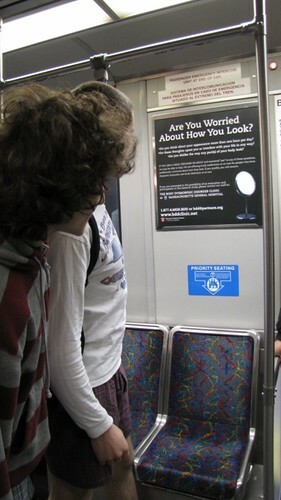 Today, 44 cities across 16 countries participated in taking their pants off and riding public transit. 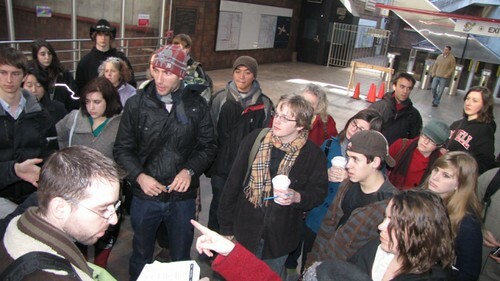 I arrived at Alewife Station in Cambridge, just north of Boston, around noon and met up with the other participants. 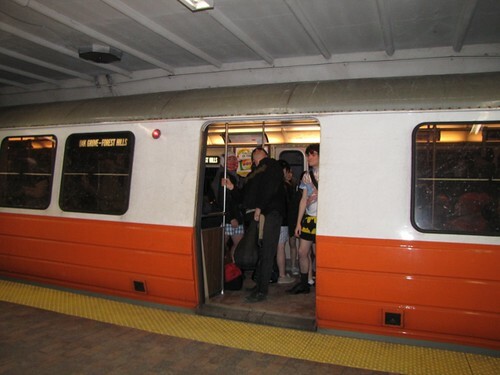 I volunteered to be a group leader, rounded up 20 or so participants, and assigned them stops along our journey down the red and orange lines to North Station and back. The plan went as follows: just before every stop, two or so people per car (about 5 subway cars per subway train) take their pants off, get off, wait until the next train, and get back on. This way, unsuspecting people have pantsless people entering and exiting their cars in small groups so it appears that the entire subway line is lacking in the pants department. While waiting to switch directions at North Station, the next train was taking an awful long time, so the MBTA announcer said over the loud speaker "There are no more trains coming so you're all going to have to walk! ".